For other uses, see Bloodletting (disambiguation). Bloodletting (or blood-letting) is the withdrawal of blood from a patient to cure or prevent illness and disease. Bloodletting was based on an ancient system of medicine in which blood and other bodily fluids were regarded as "humors" that had to remain in proper balance to maintain health. It is claimed to have been the most common medical practice performed by surgeons from antiquity until the late 19th century, a span of almost 2,000 years. In Europe the practice continued to be relatively common until the end of the 18th century. The practice has now been abandoned by modern style medicine for all except a few very specific conditions. It is conceivable that historically, in the absence of other treatments for hypertension, bloodletting could sometimes have had a beneficial effect in temporarily reducing blood pressure by reducing blood volume. However, since hypertension is very often asymptomatic and thus undiagnosable without modern methods, this effect was unintentional. In the overwhelming majority of cases, the historical use of bloodletting was harmful to patients. Today, the term phlebotomy refers to the drawing of blood for laboratory analysis or blood transfusion. Therapeutic phlebotomy refers to the drawing of a unit of blood in specific cases like hemochromatosis, polycythemia vera, porphyria cutanea tarda, etc., to reduce the number of red blood cells. The traditional medical practice of bloodletting is today considered to be a pseudoscience. Bloodletting was first performed in ancient Egypt around 1000 BCE, and later spread to the Greeks and Romans. In Greece, bloodletting was in use in the fifth century B.C. during the lifetime of Hippocrates, who mentions this practice but generally relied on dietary techniques. Erasistratus, however, theorized that many diseases were caused by plethoras, or overabundances, in the blood and advised that these plethoras be treated, initially, by exercise, sweating, reduced food intake, and vomiting. Herophilus advocated bloodletting. Archagathus, one of the first Greek physicians to practice in Rome, also believed in the value of bloodletting. "Bleeding" a patient to health was modeled on the process of menstruation. Hippocrates believed that menstruation functioned to "purge women of bad humors". During the Roman Empire, the Greek physician Galen, who subscribed to the teachings of Hippocrates, advocated physician-initiated bloodletting. 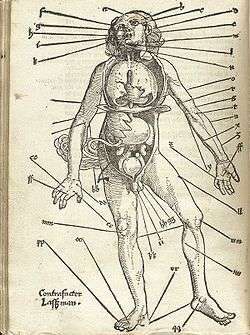 The popularity of bloodletting in the classical Mediterranean world was reinforced by the ideas of Galen, after he discovered that not only veins but also arteries were filled with blood, not air as was commonly believed at the time. There were two key concepts in his system of bloodletting. The first was that blood was created and then used up; it did not circulate, and so it could "stagnate" in the extremities. The second was that humoral balance was the basis of illness or health, the four humours being blood, phlegm, black bile, and yellow bile, relating to the four Greek classical elements of air, water, earth and fire respectively. Galen believed that blood was the dominant humour and the one in most need of control. In order to balance the humours, a physician would either remove "excess" blood (plethora) from the patient or give them an emetic to induce vomiting, or a diuretic to induce urination. Galen created a complex system of how much blood should be removed based on the patient's age, constitution, the season, the weather and the place. "Do-it yourself" bleeding instructions following these systems were developed. Symptoms of plethora were believed to include fever, apoplexy, and headache. The blood to be let was of a specific nature determined by the disease: either arterial or venous, and distant or close to the area of the body affected. He linked different blood vessels with different organs, according to their supposed drainage. For example, the vein in the right hand would be let for liver problems and the vein in the left hand for problems with the spleen. The more severe the disease, the more blood would be let. Fevers required copious amounts of bloodletting. The Talmud recommended a specific day of the week and days of the month for bloodletting, and similar rules, though less codified, can be found among Christian writings advising which saints' days were favourable for bloodletting. During medieval times bleeding charts were common, showing specific bleeding sites on the body in alignment with the planets and zodiacs. Islamic medical authors too advised bloodletting, particularly for fevers. It was practised according to seasons and certain phases of the moon in the lunar calendar. The practice was probably passed by the Greeks with the translation of ancient texts to Arabic and is different than bloodletting by cupping mentioned in the traditions of Prophet Muhammad. When Muslim theories became known in the Latin-speaking countries of Europe, bloodletting became more widespread. Together with cautery, it was central to Arabic surgery; the key texts Kitab al-Qanun and especially Al-Tasrif li-man 'ajaza 'an al-ta'lif both recommended it. It was also known in Ayurvedic medicine, described in the Susruta Samhita. Even after the humoral system fell into disuse, the practice was continued by surgeons and barber-surgeons. Though the bloodletting was often recommended by physicians, it was carried out by barbers. This led to the distinction between physicians and surgeons. The red-and-white-striped pole of the barbershop, still in use today, is derived from this practice: the red symbolizes blood while the white symbolizes the bandages. Bloodletting was used to "treat" a wide range of diseases, becoming a standard treatment for almost every ailment, and was practiced prophylactically as well as therapeutically. Bloodletting only began to be seriously questioned in the second half of the 1800s, as the development of evidence-based medicine led to new statistical methods for evaluating treatment effectiveness. While many physicians in England at the time had lost faith in the general value of bloodletting, some still considered it beneficial in some circumstances, for instance to "clear out" infected or weakened blood or its ability to "cause hæmorrhages to cease"—as evidenced in a call for a "fair trial for blood-letting as a remedy" in 1871. Bloodletting persisted into the 20th century and was even recommended by Sir William Osler in the 1923 edition of his textbook The Principles and Practice of Medicine. A number of different methods were employed. The most common was phlebotomy, or venesection (often called "breathing a vein"), in which blood was drawn from one or more of the larger external veins, such as those in the forearm or neck. In arteriotomy, an artery was punctured, although generally only in the temples. 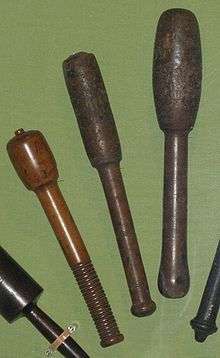 In scarification (not to be confused with scarification, a method of body modification), the "superficial" vessels were attacked, often using a syringe, a spring-loaded lancet, or a glass cup that contained heated air, producing a vacuum within (see fire cupping). There was also a specific bloodletting tool called a scarificator, used primarily in 19th century medicine. It has a spring-loaded mechanism with gears that snaps the blades out through slits in the front cover and back in, in a circular motion. The case is cast brass, and the mechanism and blades steel. One knife bar gear has slipped teeth, turning the blades in a different direction than those on the other bars. The last photo and the diagram show the depth adjustment bar at the back and sides. 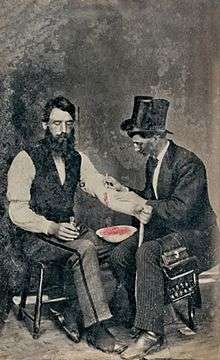 Bloodletting in 1860, one of only three known photographs of the procedure. Leeches could also be used. The withdrawal of so much blood as to induce syncope (fainting) was considered beneficial, and many sessions would only end when the patient began to swoon. Leeches became especially popular in the early nineteenth century. In the 1830s, the French imported about forty million leeches a year for medical purposes, and in the next decade, England imported six million leeches a year from France alone. Through the early decades of the century, hundreds of millions of leeches were used by physicians throughout Europe. 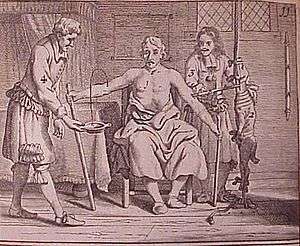 Bloodletting was also popular in the young United States of America, where Benjamin Rush (a signatory of the Declaration of Independence) saw the state of the arteries as the key to disease, recommending levels of bloodletting that were high even for the time. George Washington asked to be bled heavily after he developed a throat infection from weather exposure. Within a ten-hour period, a total of 124-126 ounces (3.75 liters) of blood was withdrawn prior to his death from a throat infection in 1799. One reason for the continued popularity of bloodletting (and purging) was that, while anatomical knowledge, surgical and diagnostic skills increased tremendously in Europe from the 17th century, the key to curing disease remained elusive, and the underlying belief was that it was better to give any treatment than nothing at all. The psychological benefit of bloodletting to the patient (a placebo effect) may sometimes have outweighed the physiological problems it caused. Bloodletting slowly lost favour during the 19th century, but a number of other ineffective or harmful treatments were available as placebos—mesmerism, various processes involving the new technology of electricity, many potions, tonics, and elixirs. The opening of the superficial vessels for the purpose of extracting blood constitutes one of the most common operations of the practitioner. The principal results, which we effect by it, are 1st. The diminution of the mass of the blood, by which the overloaded capillary or larger vessels of some affected part may be relieved; 2. The modification of the force and frequency of the heart's action; 3. A change in the composition of the blood, rendering it less stimulating; the proportion of serum becoming increased after bleeding, in consequence of its being reproduced with greater facility than the other elements of the blood; 4. The production of syncope, for the purpose of effecting a sudden general relaxation of the system; and, 5. The derivation, or drawing as it is alleged, of the force of the circulation from some of the internal organs, towards the open outlet of the superficial vessel. These indications may be fulfilled by opening either a vein or an artery. Today it is well established that bloodletting is not effective for most diseases. Indeed, it is mostly harmful, since it can weaken the patient and facilitate infections. Bloodletting is used today in the treatment of a few diseases, including hemochromatosis and polycythemia; however, these rare diseases were unknown and undiagnosable before the advent of scientific medicine. It is practiced by specifically trained practitioners in hospitals, using modern techniques. In most cases, phlebotomy now refers to the removal of small quantities of blood for diagnostic purposes. However, in the case of hemochromatosis, which is now recognized as the most common genetic, or inherited, disorder, frequent bloodletting has become an essential, and life-saving procedure. Though bloodletting as a general health measure has been shown to be harmful, it is still commonly indicated for a wide variety of conditions in the Ayurvedic, Unani, and traditional Chinese systems of alternative medicine. Unani is based on a form of humorism, and so in that system, bloodletting is used to correct supposed humoral imbalance. Wikimedia Commons has media related to Bloodletting. 1 2 B.) Anderson, Julie, Emm Barnes, and Enna Shackleton. "The Art of Medicine: Over 2,000 Years of Images and Imagination [Hardcover]." The Art of Medicine: Over 2, 000 Years of Images and Imagination: Julie Anderson, Emm Barnes, Emma Shackleton: 9780226749365: Amazon.com: Books. The Ilex Press Limited, n.d. Web. 29 Sept. 2013. 1 2 "Bloodletting Over the Centuries". Gilbert R. Seigworth, M.D. 1980. Retrieved 2009-07-12. ↑ Phlebotomy (book). Bonnie K. Davis. 2001. ISBN 978-0-7668-2518-5. Retrieved 2009-07-12. ↑ "The Basis of Therapeutic Phlebotomy". James C. Barton, M.D. 2009. Retrieved 2009-07-12. ↑ "Therapeutic Phlebotomy". Carteret General Hospital. 2009. Retrieved 2009-07-12. ↑ Williams, William F. (December 3, 2013). Encyclopedia of Pseudoscience: From Alien Abductions to Zone Therapy. Routledge. ISBN 1135955298. ↑ "Degeneration of Medicine and the Grisly Art of Slicing Open Arms". BBC. 29 November 2002. Retrieved 2009-07-12. ↑ Encyclopedia of ancient Greece. Nigel Guy Wilson. 2006. ISBN 978-0-415-97334-2. Retrieved 2009-07-12. ↑ A.) Conrad, Lawrence I. The Western Medical Tradition: 800 B.C.-1800 A.D. Cambridge, Eng. : Cambridge UP, 1995. Print. ↑ Conrad, Lawrence I. The Western Medical Tradition: 800 B.C.-1800 A.D. Cambridge, Eng. : Cambridge UP, 1995. Print. ↑ "The history of bloodletting | BC Medical Journal". eb.archive.org. Retrieved 2014-01-27. ↑ "British Medical Journal". British Medical Journal. 1 (533): 283–291. March 18, 1871. doi:10.1136/bmj.1.533.283. PMC 2260507 . ↑ Clutterbuck, Henry (1838). Dr Clutterbuck's Lectures On Bloodletting: Lecture 1. The London Medical Gazette. ↑ P K Rangachari, Evidence-based medicine: old French wine with a new Canadian label?, J R Soc Med. 1997 May; 90(5): 280–284. ↑ Leech Therapy- A Holistic Approach of Treatment in Unani (Greeko-Arab) Medicine, Anc Sci Life. 2011 Jul–Sep; 31(1): 31–35. PMCID: PMC3377041. ↑ Ayurveda - Panchakarma Archived March 30, 2013, at the Wayback Machine., holistic-online.com. ↑ Study strategies for bloodletting therapy in treatment of acute soft tissue injuries, Chen PD, Chen GZ, Xu YX, Zhong Xi Yi Jie He Xue Bao. 2011 Mar;9(3):237-41. Carter, K. Codell; Barbara R. Carter (February 1, 2005). Childbed fever. A scientific biography of Ignaz Semmelweis. Transaction Publishers. ISBN 978-1-4128-0467-7.